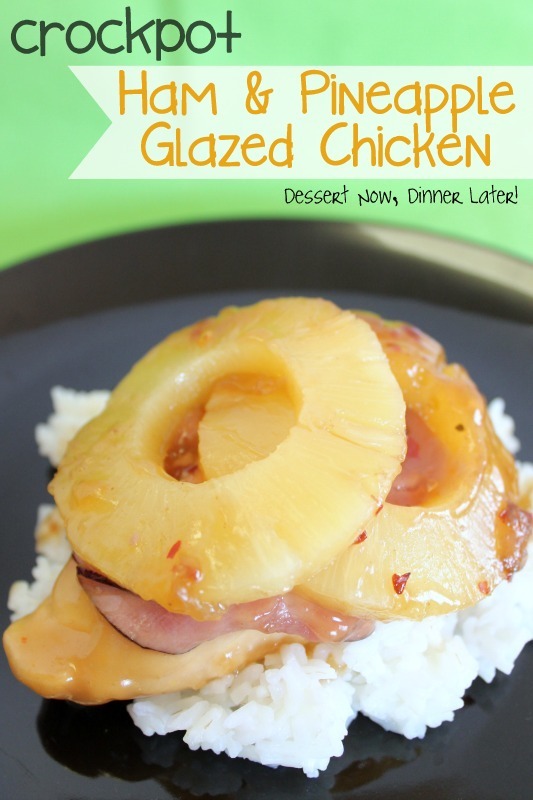 Crockpot Ham & Pineapple Glazed Chicken - Dessert Now, Dinner Later! The weather is warming up & it is almost crockpot season. I am going to try & hook you up with some good recipes. The only thing that holds me back from these types of recipes is the photography part. 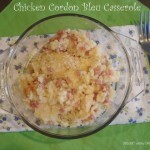 Casseroles & crockpot dinners are incredibly hard to make appetizing in pictures. Anyway, I saw this Slow Cooker Pineapple Glazed Chicken from Six Sisters’ Stuff & the shiny glaze had me sold. I tweaked it to make it my own by adding ham making it super scrumptious! 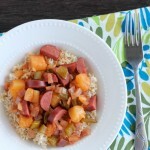 This has easy & delicious written all over it! 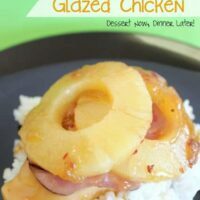 My husband thought the glaze even tasted like a saucy orange chicken. It’s definitely Asian inspired with a Hawaiian twist. Give it a try & tell me what you think! Spray the inside of a crockpot with baking spray. Place chicken breasts on the bottom. 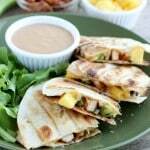 Top each chicken breast with 3 deli-thin slices of black forest ham. 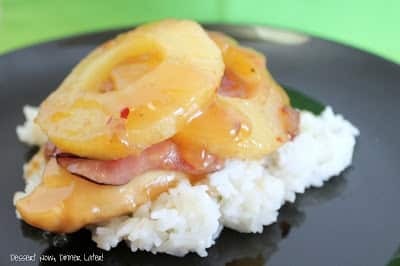 Layer pineapple rings on top of the ham. Whisk reserved pineapple juice with the rest of the ingredients in a bowl & pour over the top of the prepared chicken breasts. Cook on low for 5-6 hours or high for 3-4 hours. Serve over a bed of rice. Oh yum!! That sounds awesome!!! This looks so good. 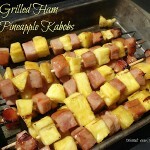 I wish I had ham to make this, this weekend! I would love if you would if you link up at Tried & True Thursdays. So excited. In my crockpot now for dinner tonight. Can’t wait to see how it comes out. Yum! Haven’t had this one in a while. I hope you love it!